WHAT? A radish by any other name... Also known as Rose Heart, Beauty Heart, Shinrimei, Misato, Asian Red Meat, or Xin Li Mei, this mild, slightly sweet radish is deceptive. The root’s dull greenish-white exterior belies its vibrant interior—at its heart, this tangy radish boasts bright magenta flesh. 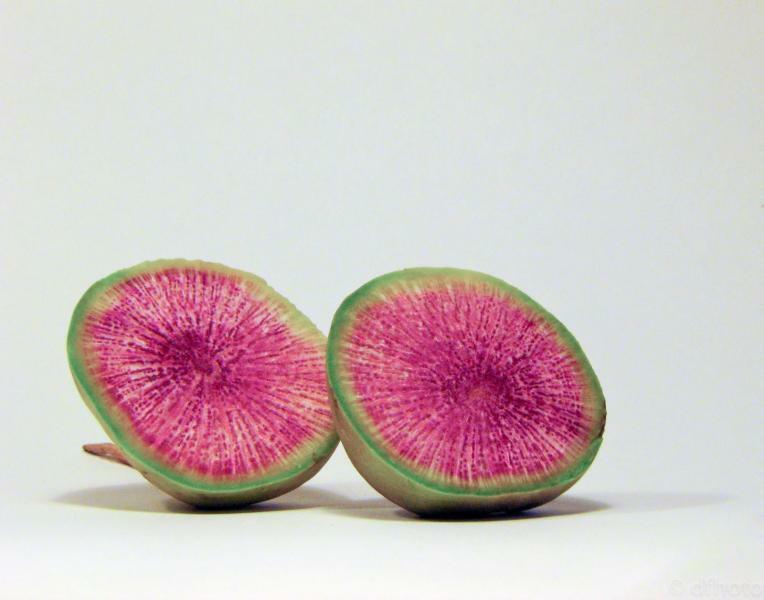 When you slice into the greenish outer rind to reveal the pink center, it’s clear how this blushing bulb got its Western name, watermelon radish. Don’t let the name and size (they can grow to be the size of a grapefruit) scare you—this is no genetically engineered melon-radish hybrid, it’s an heirloom variety of daikon radish. Originally grown in China, the pale green cream roots of Raphanus sativus are round and grow to a diameter of 4”. Its interior is bright magenta and looks much like the inside of a watermelon in color and texture. While by no means as sweet as the fruit for which it is named, this radish is not as “hot” as the more familiar red summer radishes. It has a milder taste with just the tiniest bit of a kick. 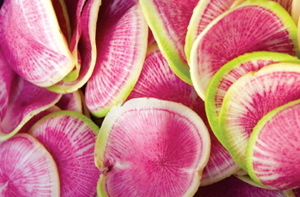 Watermelon radish is a winter vegetable. It requires cooler growing conditions and does best when planted in the autumn. The Chinese have long believed that this root has medicinal properties. The watermelon radish, while very low in calories, is a nutritional powerhouse, rich in antioxidants, vitamins, and minerals. Easy to grow and great wow factor!